We understand that at first it might seem like a nice way to save some money, and we applaud you for being creative, but if you find yourself ever in need of auto repair, please, please, PLEASE, call us or stop by instead of trying to fix things on your own – at least as seen above. For obvious reasons, of course. Although, not obvious to everyone. In the tech world that we live in where information is available at our fingertips, it can be easy to search for do-it-yourself auto repairs online in an attempt to save a little money in your pocket. While we are not opposed to such practices, we would like you to consider the idea of bringing your car down to A+ Auto Care so we can take a look at your vehicle with you and help you diagnose your problem. 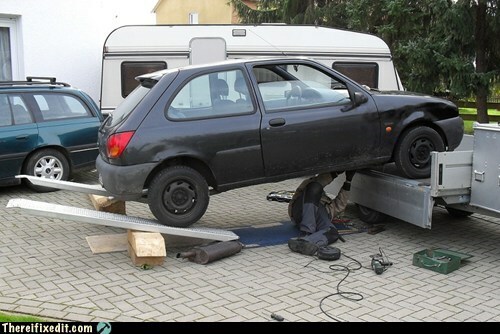 Savings of doing it on your own may not outweigh the time and effort it would save you by having the mechanic look at it. Leaving your car at A+ Auto Care for its oil changes, tune ups or even more time-consuming services while you enjoy lunch and watch the game at Jumps Bar & Grill is WAY better than working in the hot sun and getting your hands full of oil! Most of the time, you lack the necessary tools at home to do the job right, which may lead you to have to borrow someone else’s tools, and we all know where that can lead! Leaving your vehicle in the capable hands of your mechanic can give them the opportunity to check your vehicle for other known issues or for dangerous wear and tear on your vehicles components. Trained technicians can check for abnormalities BEFORE they become bigger repair issues, saving you A LOT of money in the long run. Taking care of your vehicle as often as the manufacturer recommends the services be done is a vital part of keeping repair costs down and is a MUST for getting the most out of your investment. Stop by our shop to find out what we can do for you.